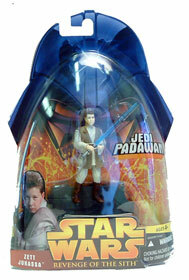 Description Of Item: What could be more exciting than toys for the next Star Wars film? This awesome set of return of the sith figures feature a new level of enhanced articulation for incredible action poses! Each comes on a new ROTS bubble card with detailed accessories and a biography! Supplies are limited and demand is huge, so lock in on these sweet characters now while they last!